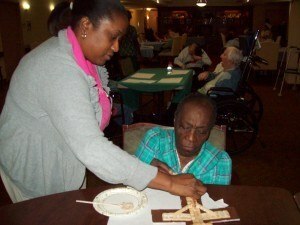 Each month at The Peninsula, an assisted living and memory support community, residents have craft classes as part of their monthly calendar of activities. “Many of these classes are themed around holidays and seasons. 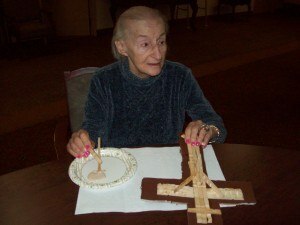 For example, in April residents are creating wooden crosses and tie-dying Easter eggs,” explained Michelle Hertz, resident programming coordinator. Crafting brings tremendous enjoyment and there are so many benefits. Peninsula residents derive so much satisfaction and are always looking forward to their new craft projects. “There’s a sense of accomplishment in crafting,” she added. “It makes no difference of the size of a craft project; crafting involves creating something from nothing. The end result is a finished work and it is very satisfying to be able to say, “I made it”. Regardless of someone’s age, crafting taps creativity. It’s a wonderful outlet of self-expression and a way someone can show their uniqueness. At The Peninsula, our crafting classes give residents something to look forward to during the week and people find the crafting classes relaxing experiences as well as social. There’s camaraderie working together and sharing this friendly time. The Peninsula is located at 5100 W. Hallandale Beach Boulevard in Hollywood and is a luxurious retirement community offering assisted living and independent living apartments and services. The community’s separate and secured memory care residence, The Garden, is specially designed for seniors with Alzheimer’s disease or related dementias. The community offers a variety of private or semi-private resident suites, a grand dining room with restaurant-style service, a theater and many other common areas for residents and their guests to enjoy. Well-trained staff is accessible 24-hours per day, offering personalized care and services to the residents. 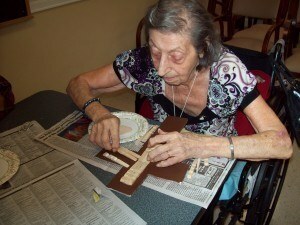 For more information, please call 954-893-7755 or visit www.ThePeninsulaAssistedLiving.com.